1. Preheat oven to 450°. Spray 9-inch square glass or ceramic baking dish with nonstick cooking spray. Heat large covered saucepot of salted water to boiling over high heat. Add spaghetti and cook as label directs; drain and return to saucepot. 2. Meanwhile, heat large nonstick skillet over medium-high heat. Add beef and bell pepper and cook 7 to 9 minutes or until browned, breaking up meat with side of spoon. Stir in salsa and taco seasoning; heat to boiling. Reduce heat to medium-low and simmer 3 minutes or until slightly thickened, stirring occasionally. 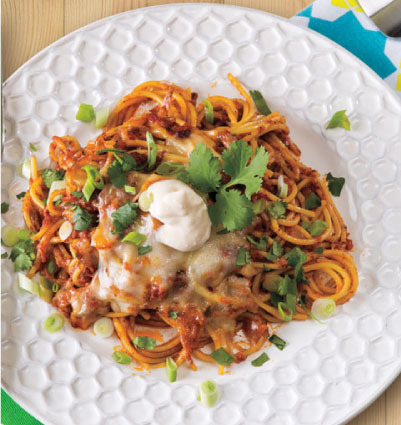 Pour sauce over spaghetti; add 1 cup cheese and toss until well combined. 3. Transfer spaghetti mixture to prepared dish, spreading mixture evenly in dish; sprinkle with remaining 1 cup cheese. Bake 15 to 17 minutes or until top is crispy. Let stand 5 minutes. Serve sprinkled with onions and cilantro. The spaghetti will continue to cook in the oven, so boil it just until it’s ‘al dente’, Italian for ‘to the tooth’, meaning that the spaghetti is still slightly on the firm side. Serve with a dollop of sour cream for a little richness.